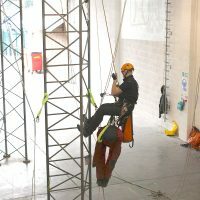 Purpose designed training centre providing specialist work at height and rescue courses to businesses across the East and North East of England. Courses are available for riggers and technicians who currently work or wish to work at height in sectors such as wind (onshore/offshore), telecoms, utilities, oil & gas, the emergency services and other general industries. A comprehensive range of courses are available from basic harness fitting and PPE inspection to specialist work at height and rescue. Courses can be booked online, see upcoming courses. The centre is located just outside Leeds on the M621 motorway giving excellent access to the M1 and M62 corridors, within easy access of all parts of Yorkshire, Lancashire and the North East as well as the energy hubs along the East coast. Less than an hour or so travel time from Harrogate, Hull, York, Sheffield, Manchester. We provide free customer parking and Wi-fi is also available for customer convenience. 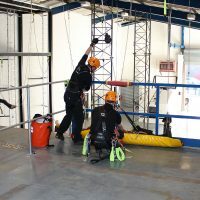 The Leeds height safety training centre is purpose designed to meet increasing demand for specialist work at height and rescue training for industries across the East of England. Here we focus on training delivery for the onshore and offshore renewable sector with Global Wind Organisation (GWO). We also serve telecoms industry with ARQIVA Gateway approved courses and offer courses for construction, emergency services and general work at height sectors and includes courses such as basic harness fitting, roof safety and PPE inspection. This centre boasts nearly 8,000 square feet of training facilities and classrooms, with a comprehensive range of training structures including a wind turbine simulator, elevated platforms, scaffolding, suspended steel work, a large range of ladders and internal and external towers. All our practical training areas are heated. On successful completion of your course you will receive your certificate, Secure ID card and access to electronic course notes.